It has been observed that a common practice is to confuse geysers with volcanoes. More often the case has been of interchanging these two words with their counterparts. Although it is true that both the mentioned phenomenon are similar in a few ways, most significantly due to the fact that both of them are the result of a very strong source of heat under the ground, but apart from that, they have many considerable differences in their mechanisms. A very simple and well observed difference is that although geysers have been known to initiate close to volcanoes or as they are commonly referred to, in volcanic regions; volcanoes on the other hand do not need to have geysers around. Before moving on to further differences, it is essential to know what exactly geysers and volcanoes are! In layman terms, geysers involve the shooting out of hot water in its liquid or gas phase (steam) whereas volcanoes refer to eruptions of dust, matter, rocks and lava (molten rock). 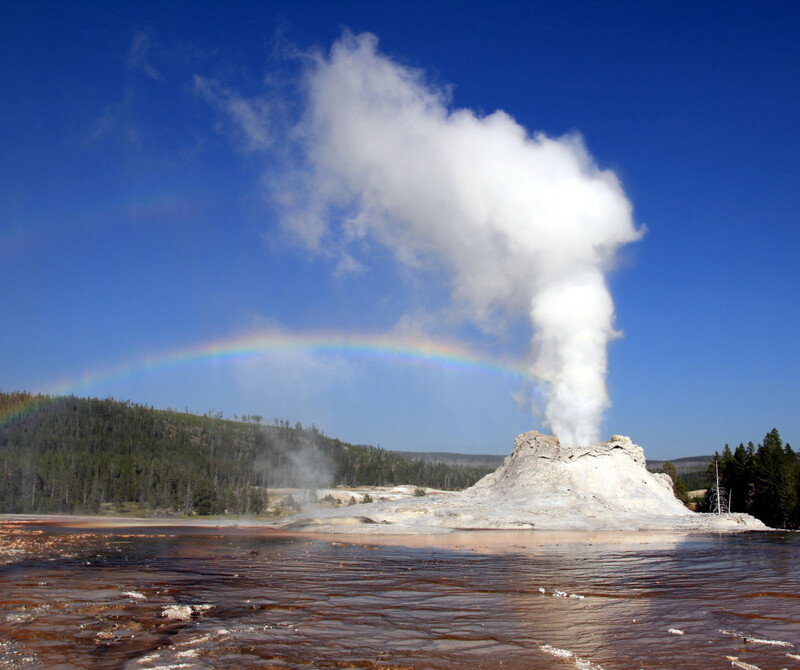 To begin with, geysers refer to a phenomenon that takes place on the surface. Ground water close to the surface, due to the strong source of heat underground, is heated to very high temperatures until it boils. The result? Ejections of hot water as well as steam from the Earth’s surface! This is not as simple and harmless as it sounds. The eruptions can be of thousands of gallons of extremely hot water! In contrast, volcanoes occur due to hot magma that makes its way up through the cracks in the crust. On reaching the top of, suppose, a mountain, it blows off its roof and what was previously a mountain is now termed as a volcano. There are a number of factors and physical features that contribute to each of these natural occurrences without which they would not occur or even if they did, their intensity would be very low. Geysers will only develop if there is a system of narrow channels which, in geology, is referred as a plumbing system. Water and heat also needs to be present and what is quite amazing is the fact that usually this water comes from rain and snow and seeps from in between the cracks in the stone deep into the rock. It is also necessary that the water gains a lot of heat and the pressure increases substantially. Volcanoes require the presence of pieces of rock that have broken off the main rock. In addition to this, the plates that make up the Earth’s crust sometime move and the friction between them is what causes earthquakes and eruptions of volcanoes close to the edge of those particular plates. The degree to which each of these two natural calamities can be harmful or affect human life and settlements also presents a very important difference between the two. The eruptions of water, which we term geysers, are usually less harmful than volcanoes owing to the fact that it’s just hot water that rushes out; it cannot do much to destroy settlements. Obviously, it is not at all advisable to go too close to them, but in many parts of the world, geysers have contributed positively by being developed into tourist attractions. As opposed to these, volcanoes can sometimes cause a great deal of destruction of buildings, life and property. The nearby areas get covered in a lot of ash which makes it extremely difficult to breathe and also ensures very high temperatures in the nearby areas. They can also cause lightning, thunder and heavy rainfalls whereas lava can easily kill people, plants and animals. Volcanoes as a whole can lead to fires in nearby settlements, famines as well as earthquakes. Geysers-eruptions of water; volcanoes-eruptions of rocks, lava dust etc. de. "Difference Between GEYSERS AND VOLCANOES." DifferenceBetween.net. September 3, 2014 < http://www.differencebetween.net/science/nature/difference-between-geysers-and-volcanoes/ >.